6.25 points at 40 votes (rank 578). 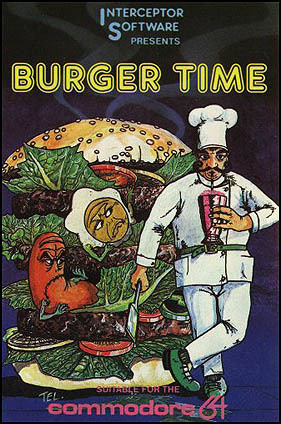 In the game Burger Time you play a small man in head cook uniform, that needs to complete 4 hamburgers in every level. Every hamburger consists of 4 "components" (lower half of the bun, meat, salad leaf, upper half of the bun). The single parts lie over each other on different platforms in a ladder labyrinth and to complete the burgers you need to move them downwards. This happens by walking over the parts!?! If you e.g. walk over the upper half of a bun every segment that you passed goes down a bit, when you have walked over the complete part it falls down a level. If there is another part lying on the level below (the salad leaf), then it will also be kicked another level lower. From the lowest level a part falls into the plate as soon as you walk over it! When you have all 4 burgers complete in the plates you have made the level. So that the games is not too easy, some computer bots walk around (evil eggs and sausages), which you'd better avoid. When contacting them it will cost a life, so the same system as with Pacman. The further you get, the harder get the ladder labyrinths and the more bots follow you. As your only weapon against the computer bots you have a limited supply of pepper, the enemies are then distracted for a short time when you throw the pepper at them. As an alternative, the walking eggs and sausages can get between the burgers, which will give them a short break and more points for you. An animation of the game. The graphics are relatively simple but also rather cute, for a game in a ladder labyrinth - as they were released in a short number about 1984 - the graphics are very pleasant. The sound is a bit sparse but ok, a bit more background music would have been likeable. The controls are very easy, walking and climbing is done by moving the joystick in port 2 or keyboard into the corresponding direction, the fire button is need for throwing pepper. You need to climb exactly, furthermore you need to keep a distance to eggs and sausages du to their big size, as they cost a life when touching them. Unfortunately the C64 version doesn't make a note which burger parts are already in the plate, when losing a life. In every level you start with 3 portions of pepper. If you collect the pepper caster, you will get 2 additional portions of pepper. Every burger part that falls onto the plate counts 50 points. Eggs and sausages that get into the burger count 200 points. The collected pepper caster gets you 200 points. 1000 bonus points for each finished level. A possibity is to use the "strategy element" of this game and to always walk over the uppermost part of a Burger, as this is a "minimisation of the path". Our head cook moves a bit slower on steps (ladders) and should only use them when really needed while being followed. Jodigi: "A nice pastime and a not too hard arcade game, whereas I like the machine version better, especially that there are more enemies in the repeating levels." Guybrush: "Burger Time is a small diversion for in between, also due to the cute optics, but there is no long time motivation created here. 5 points from me." Robotron2084: "A really terrible conversion of the amusement arcade classic. Completely unintelligent enemies, slow gameplay and the worst: the positions of the ingredients are set back to starting state after each time you lose a life, which tops it all. Charity point for the saucy title melody. 3 points." TheKills: "For me there was not really cause for joy. The graphics may be cute, which does not upvalue the game." Maja: "I think the game is so and so, if I play it, I think about ordering something to eat, why could that be? ;-) Anyway, 6 points from me." Werner: "I subscribe to Robotrons2084's view." Shakermaker303: "Hehe, memories bubble up here. It was entertaining to a certain point, and then I just didn't manage to get further. It is forsooth not the best game, but from me it gets a nostalgia bonus and I plead for close 6 out of 10 points." Peter: "I think this game is super. Somehow I got used to playing it after ordering something to eat, to spend my time with it." Virtualsky: "I was so disappointed when I saw this version of Burger Time. I found it so far removed from the original that I was insulted and I knew the C64 deserved better. 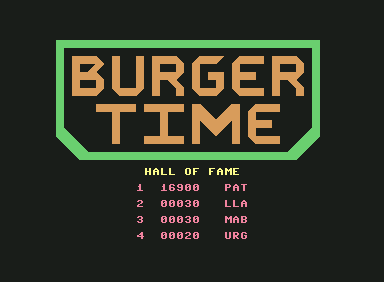 To be honest, the best home version of Burger Time I've ever played was the one made for my Intellivision. I mean, they had the bounce in the cook's walk, the sausage sauntered when they walked, the use of pepper reacted much more like in the arcade video game, and the controls were quick and tight. You even had spinning pickles to battle in the higher levels, just like in the arcade. Why they could do all of this on the Intellivision and not on the c64, I could never figure out." 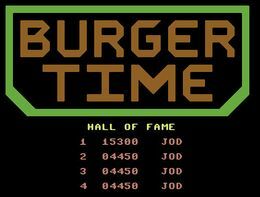 Burger Time in the Killer List Of Videogames. This page was last modified on 30 September 2017, at 03:10.